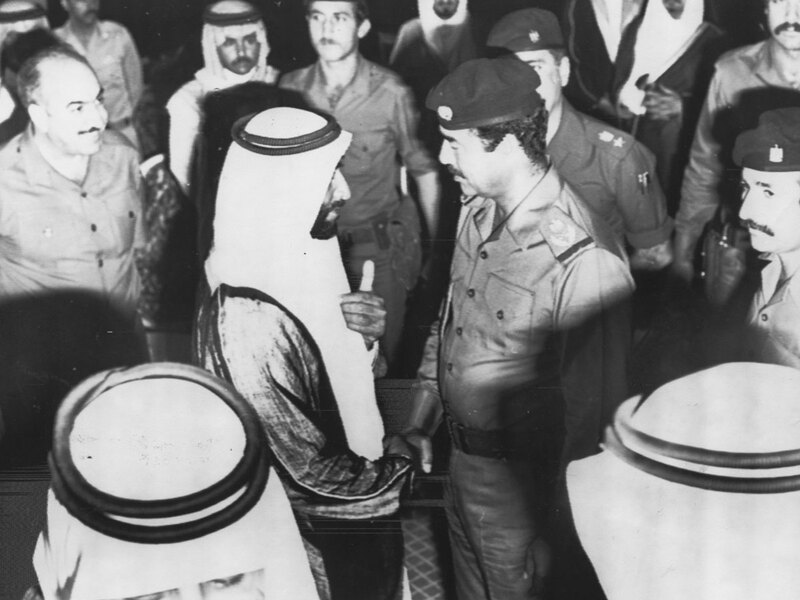 Shaikh Zayed asked me to meet Saddam Hussain after the latter expressed to him that he had reservations towards me. He placed the reports in front of me. Sadam was surprised at my courageous words. He is used to hearing only from men who satisfied his ears. After this confrontation, we became friends. Until the invasion of Kuwait, but we kept a thread of a relation. I knew the invasion of Iraq was one of the goals of George Bush, the son. We tried to persuade him not to do it: I personally asked him to invest the money to be spent on war instead on the people of Iraq. To build schools, hospitals and infrastructure. But the decision was already taken. I went to meet Saddam myself. We had a five-hour talk. An honest and candid one. We discussed matters that we agreed upon and a lot of others that we disagreed on. I reminded him of the war and its coming skeletons. And it was evident that he would not win a war against the Americans; and that Iraq would lose everything. He grew in my eyes after that. Saddam left our five-hour meeting, four times breaking protocol. He terrified everyone in that room, even his personal secretary Abed Hamoud. Saddam wouldn’t sit in the same place for a long time. He was afraid of being bombed or shot. He knew he was on the hit list of many enemies. At the end of our meeting, he walked me to the car, and opened the door for me. It was something he never did, as I later came to know. And because his men were terrified of him, no one dared to be honest with him and tell him the real capabilities of his army. They opted to let him believe that they can fight the Americans. No one can truly win with the weapons of war for a long time. Saddam paid the price of his convictions. After the invasion, Iraq did not remain as it is. Neither did the region stay the same. Iraq lost many of its sons, decades of development. The Americans lost more than a trillion dollars and thousands of its men. The region also lost decades of development and peace. From Iraq, terrorist groups were born and terrorised the world. Since childhood until I reached adulthood, I had always seen Syria as one of the countries crucial to the region. Syria, the civilization. Syria, the Arab nation. Syria, the nature -- and beauty history and culture. It’s been said that civilisation in Syria goes back 8,000 years; that 40 civilisations were on its lands. The beginning of human civilisation was in Syria, through the invention of the alphabet and agriculture. 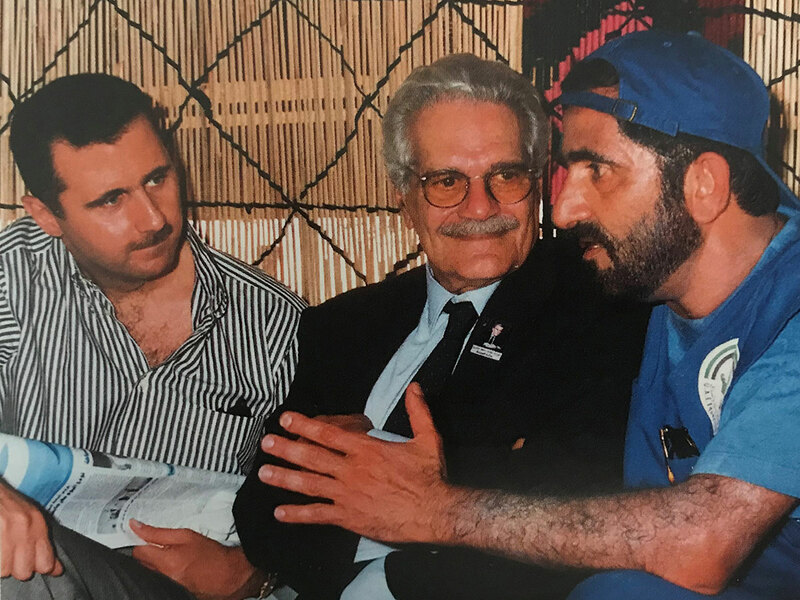 Towards the end of the 1990s, I remembered Bashar’s visit to Dubai. He was not yet president. We discussed technology and its role in development. He was very excited to invest in technology that would serve his country. And he assured me that he will be doing lots of changes in Syria. It was the start of a good relationship. 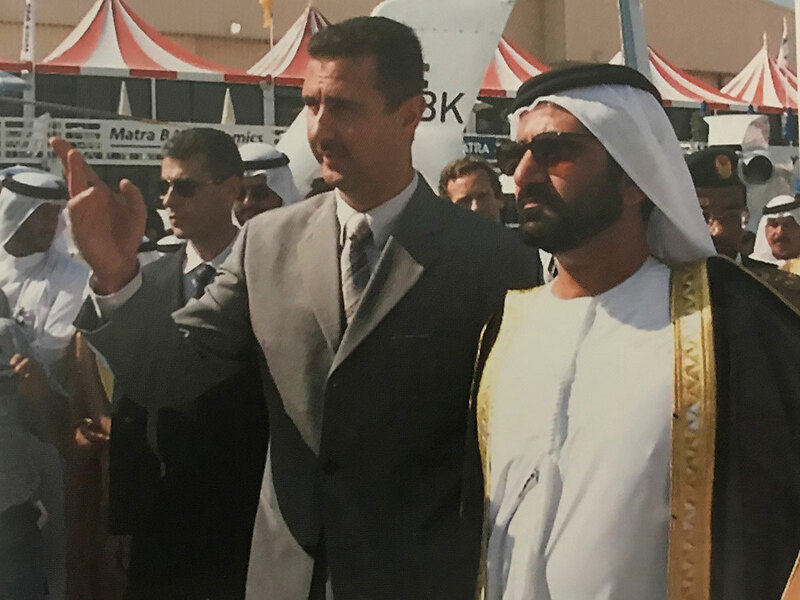 A few years later, he again visited Dubai, this time as the President of Syria. He asked me how does Dubai run its government and institutions. He had a deep desire to develop the administration and government in Syria. I talked to him extensively about Dubai, its open economy and the adoption of a management system similar to the private sector. Our governance is run with the private sector mindset ¬-- in terms of service quality, efficient spending, human resources and leadership. I told him that we wish to build a model for the Arab world. At the end of his visit, he assured me that he wants to use the Dubai model in Syria. Bashar Al Assad tried to achieve economic openness: He opened the market for foreign banks, his people were allowed to open bank accounts with foreign currencies. He called upon investors to invest in Syria. Then he lived another reality: seeing his country sink in blood and destruction. I still wish for Syria to regain its history and civilisation. I still have high hopes. I’m certain that the Syrian people who were able to build 40 civilisations on their land can build a new one. They asked me why I did not write a tribute to my father? And that the lamentation of the father is a debt! You who blame me, what is wrong with you? Where is the mind to help me write? The hardest moment in life is when one has to say goodbye to the one who was the reason for his existence. The reason for his life. The reason for his success. The reason for the existence of his country. The death of my mother Shaikha Latifa in May 1983 was the main reason my father’s health deteriorated. As if two souls were separated. She took with her something from him. My sisters used to attend his bedside, night and day, until 3pm when he would welcome some of his close friends. In 1990, he turned 78 years old. Towards the end of his life, what gave him utmost happiness was to sit in one of Zabeel Palace’s balconies. To see Dubai, his developing city which he built with his sweat, engineered with his ideas, and sacrificed his days and nights for it. At 10pm, on Sunday, 7th of October 1990, Rashid passed away. 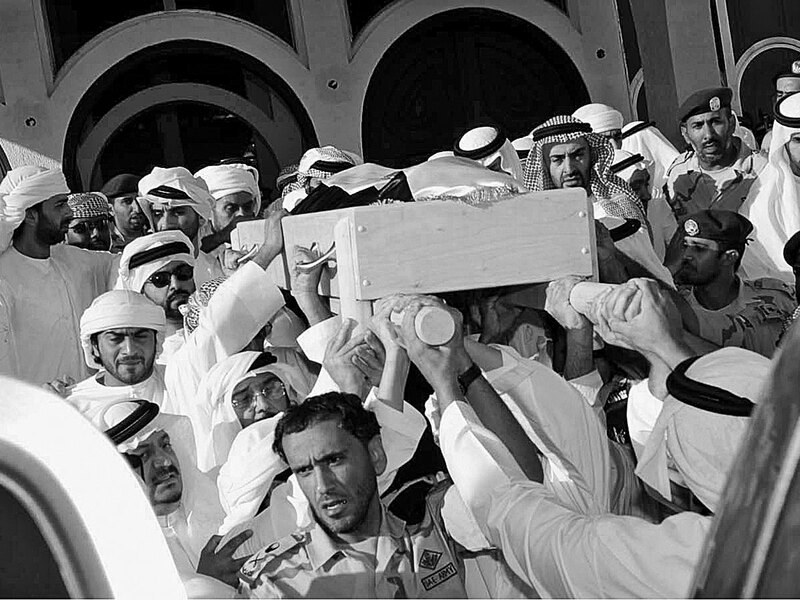 On Monday morning, the funeral of Shaikh Rashid started with my brother Shaikh Hamdan driving the vehicle which carried our father’s body. 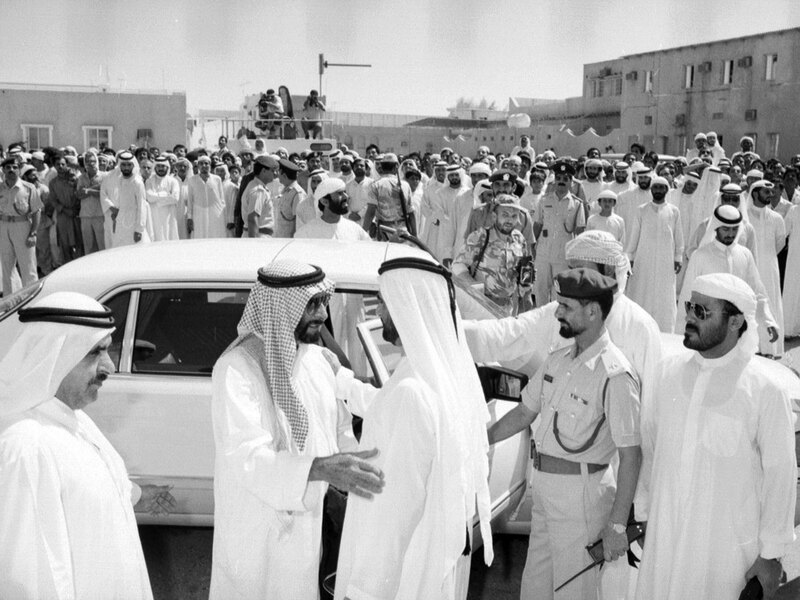 Father Shaikh Zayed was in the second vehicle. A fleet of vehicles carrying hearts that bled with grief and sorrow joined his funeral that day. And on that day, I saw many who cried for Rashid: Europeans, Asians, Africans and Americans who came to Dubai and became part of it. They joined the great experience of Rashid — who melted Dubai’s people into one pot, with no discrimination between race, colour, religion or language. Under one umbrella, they lived in Dubai not worrying about their money or children — and built a future for themselves in it. 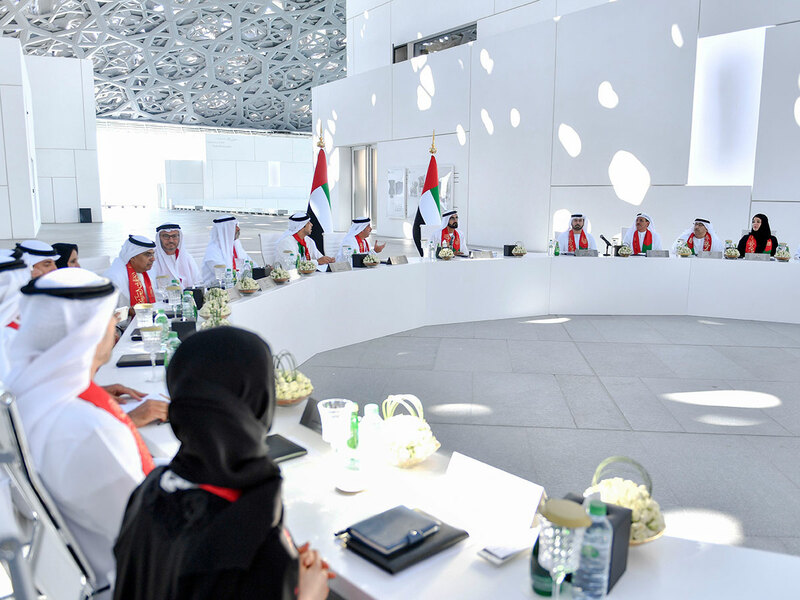 When I saw tears falling from the eyes of the simple labourers, I realised that the “Shaikh Rashid experience” touched everyone’s heart. The “Rashid experience” that came from his presence — his morning tours and whenever he went, not only to check projects, but to meet simple people. He left his fingerprints on every stone and on every corner of Dubai that he himself had built. And he will remain in the memory of its people. One day, a call came from Muammar Al Gaddafi. He told me that he wanted to build a new Dubai in Libya, which he sought to be the economic capital of the African continent. I sent Mohammad Al Gergawi, my executive secretary back then, to Libya. He arrived two days later, and met Gaddafi. He found Gaddafi sitting behind a desk, surfing the Internet. He left an impression that he had no clue about the days or the events happening around him — that he was surrounded by a team that hides the hard facts. Either out of fear, or on purpose. But I would say that the first scenario was the most probable. He would express his opinion in a rigid way, closing the door to any discussion. He was not a leader. I received Gergawi’s report and decided to go there myself on a visit. On my first day, like any other country I visit, I like to ride on my own, away from protocol and guards who try to hide reality from you. I visited the old city. It’s a city that makes you feel sad. How can a country with all those resources be like this? Sewage on the streets, garbage everywhere. Even in Dubai back in the 1950s, when our resources were limited with no electricity or water, it was not in that miserable state. 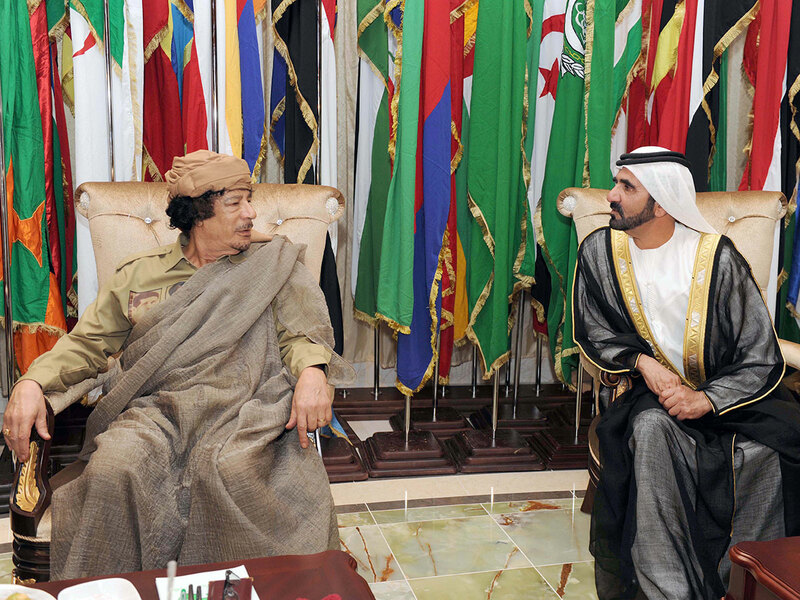 Then I visited Gaddafi in his tent and he took hold of the conversation in a monologue. Gaddafi wanted to show me the green mountains. We took a plane with his son Saif Islam and Abdullah Sanusi, the intelligence chief and Muammar’s relative, who was known to be violent. After the plane took off, Sanusi turned around and told us it was the first time he took a flight after ages. There was silence. We thought hard about his words. Did he want his first “experience” to be with us? Saif Islam spoke and he sounded more knowledgeable than his father. I spoke to him about the importance of releasing the land to the people; and opening up to the world. They did not want the change they wished for. Change does not need speeches, but achievements. Change can’t happen with the amount of corruption that took place there. Change needs a good environment. 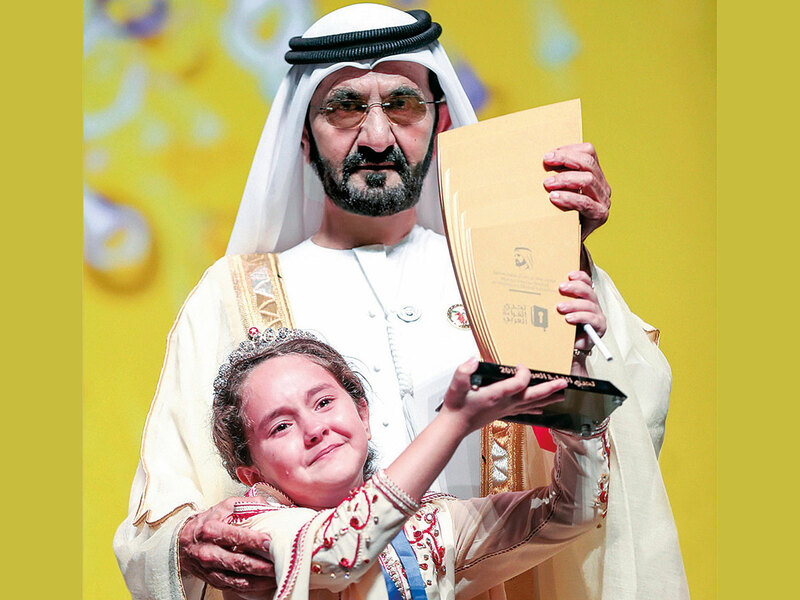 Only the people can change a country for the better, not Mohammad Bin Rashid in Libya. On the government’s role, I once gave an example to one of the leaders. Unfortunately, our region has been plagued by many failed traffic policemen. Zayed was the first ruler of the UAE, the Founding Father. The first to put its rules and regulations. Zayed is the first in everything. 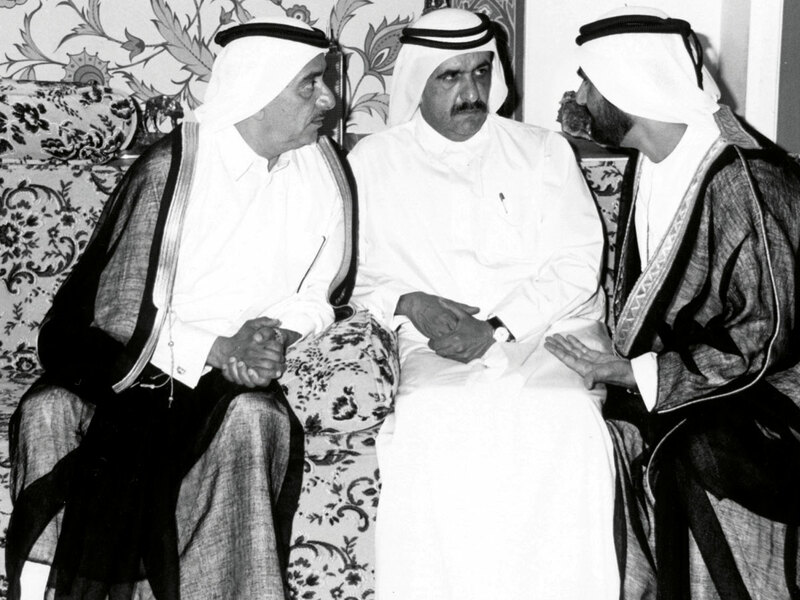 Zayed governed Al Ain since 1946; he was 28 years old. The tribes loved him, men supported him and gathered around him. He dug water wells with the people, with his bare hands. The scarcity of water and money did not stop him. He created the first school, along with the first market, the first hospital and the first roads. He was always the first. People loved him because he used to eat with them on the floor, discussed with them, took their advice and worked with them. From the simplicity of Al Ain, he started his journey, simple and humble. He succeeded in establishing a strong leadership, spreading his wisdom through more than half a century. If I were to describe him in one word, then it’s wisdom. Wisdom to use oil money well. Wisdom to manage the Union. Wisdom to solve conflicts between Arabs looking for areas of agreement. Even in his death, Zayed left us a great wisdom. He who builds a nation does not die. He who leaves behind great leaders does not die. He who did many good things does not die. He who inspired generations upon generations does not die. I used to have a horse, the greatest horse I owned in my life. When it was just a pony, I named him ‘Yezar’. Our custom is to give a pony a name till we see its full potential. Then we changed the name after it had proven itself. But since I saw him, I knew that he would be a great horse. A great horse has certain marks: Eyes tell you whether he is a leader or a follower. Wide eyes tell you it is honest and loyal. Small eyes means not ready — or doesn’t want to use its gifts. Smiling eyes indicate how easy it would be to maintain that horse. Wide eyes tell you the greatness of a horse. A wide distance between ears means a big skull, a big brain. Brains don’t mean fast; but it means the horse will understand you easily. Nose openings are a sign of endurance. Big openings mean the horse gets more oxygen; meaning larger lungs. Wide mouth means a wide oesophagus takes more air. The most important feature that helps judge a horse is the way they walk. Horses have a specific and special ratio that shapes the walk. And when you want to evaluate these proportions, the walk should be proportional. There was only one horse I owned that had all of the above. I used to visit him in my stables in Al Quoz area -- I just sat there and looked at him. He’d put his head under my arm and put a tongue out so I pulled it and gave him some carrots. He used to enjoy it if I patted his neck. What pleasure I felt when a great horse shares with me such moments. I used to just sit there and admire him for hours. 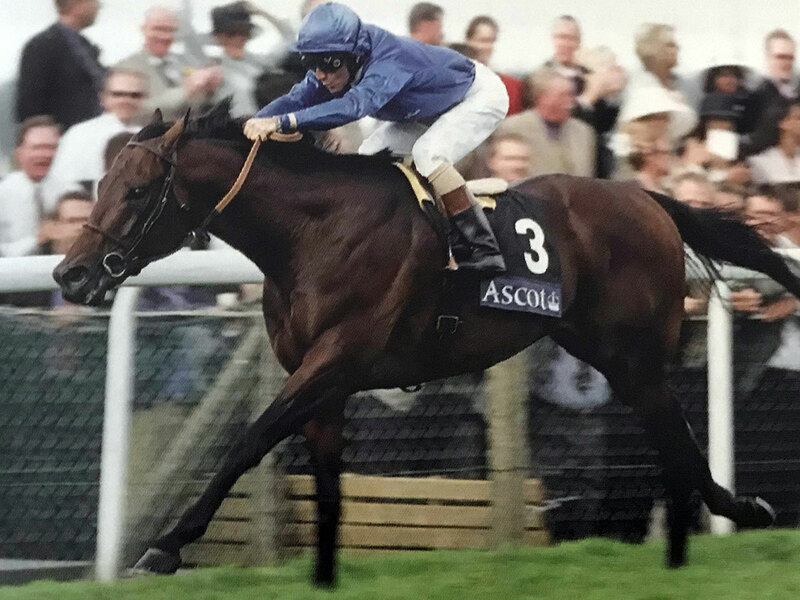 Yes, he was the greatest I owned, Dubai Millennium. We called him “Yezar” as a pony, then “Dubai Millennium” as a horse, the legend of the races that owned my heart. 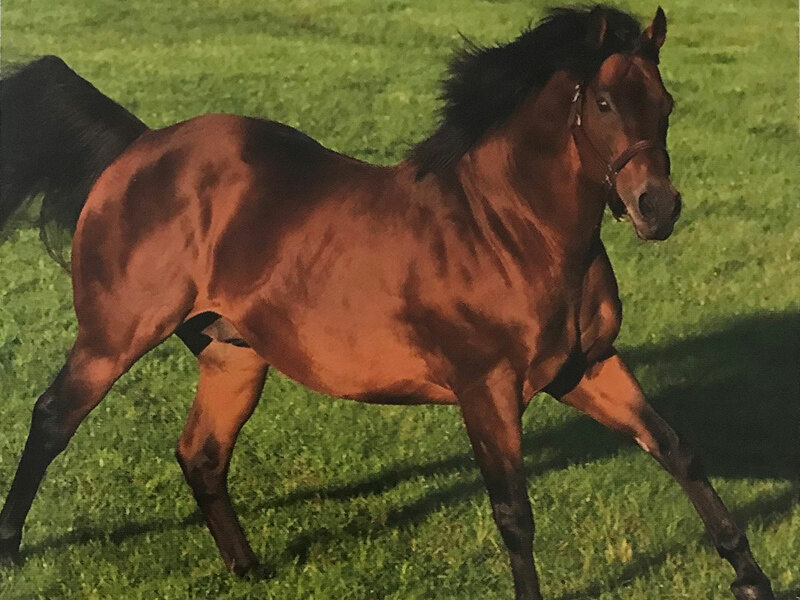 “Dubai Millennium” was a horse that loved winning, but in its own way. He raced in his own way, the way he saw fit, without listening to the rider. He kicks off the race at full speed till the end. He did not like to win by a simple margin. He loved to show off. I decided to enroll him in the Dubai World Cup 2000. On the night of the race, I sat next to him in the stables and told him: “My friend, I waited for you my whole life. Tomorrow is the desired day. The race means a lot to me. Perhaps, you want to race in Europe, or the rest of the world. “Millennium” broke the records. What happened was rare and unique in the world of racing. On 22nd April 2001, “Millennium” fell sick. A surgery was done. On the 24th of April, he was diagnosed with a disease that comes from grass. A handful of grass can kill a great winner. I travelled far and wide looking for a cure, but there was none. I had to take the hardest decision a horse owner could ever take, knowing your horse was the greatest horse in the world. He died after a surgery. He never woke up. After I was elected, I remembered withdrawing into myself, collecting my thoughts. Said a lot of prayers; implored Allah to support me, to inspire me to do the right things. The culture, the way we viewed the word “impossible” had changed. In one of my trips to Africa, we passed by a village with a school. I stopped, went to the school, a huge one with a few students attending. After I asked for the reason, the answer came: It was due to hunger. I was shocked by the answer. It took me time to comprehend it. We build schools to take out hunger. Education is a weapon, but that weapon malfunctions because of hunger. They told me: Students had go to the farms, to look for food. I ordered a new kitchen with all the supplies to be installed. And after year, I revisited the school, to find thousands attending, in morning and night classes. I felt happy. Giving is comfort -- and happiness and reassurance. Those initiatives move everybody to think positively, given all the challenges in their communities, instead of blaming the governments and waiting for them to solve our problems. You don’t need a lot of money to cause change. You just need a heart that sees the defects, and work sincerely to solve it. If only each one of us gives one-tenth of what he makes, no poor or sick or illiterate person will be among us. Our life is a journey of learning, a never-ending journey. The more we learn, the more we realise how ignorant we can be. And the more we realise the fact, that when we stop learning, we stop advancing in life. My experience can be summarized in the following 10 commandments to any government official. Serve the people: The ultimate goal of government is to serve the people. The ultimate goal of government work is to serve society. The ultimate goal of laws, regulations and procedures is to serve mankind. Never forget that. Don’t worship your chair: Your job, position and responsibilities are temporary. You will lose them if you love your chair and choose it over principles and your main purpose: Serving the people. Set your plan: When you fail to plan, you plan to fail. The leader’s key role is to steer the ship and guide and motivate his team to move in the right direction. Monitor yourself: Monitor performance in your organisation and have an in-house observer. Appoint a neutral person from outside. You must set milestones that ensure you are moving in the right direction. Build your work team: Don’t work individually, but build your team which can achieve your goals. Empower them; a great team can take you to greater heights. Innovate — or leave your post: Governments that fail to innovate lag behind. New ideas revive your spirit. The new economy is based on new ideas; and the new world is looking for talented people with innovative ideas. Maintain contact and be optimistic: Tell the world about your ambitions and abilities. Through media, you will get the public support, as they understand where you are going. Publicise your goals in the media, as you will be obliged to make every possible effort to achieve them. Maintain a good relationship with the media. The media is a friend, not an enemy. Always have competition: Competitiveness is important for every human being. Compete with yourself or others. Competition should be a lifestyle in governments. Without it, enthusiasm and courage would disappear. Make your workplace a competitive environment. Build leaders: Develop leaders who can shape the future. A real leader is the one who can build leaders. Change lives: We are lucky because we work in government. Our job is the best thing in life; it is our life. Through it, we help change the lives of millions for the better.